With killer heels, killer curves and killer harmonies, The Rockabellas have been called to the musical front line to lift the spirits of ladies and gentlemen all over the world with their unrivalled vintage vocals. 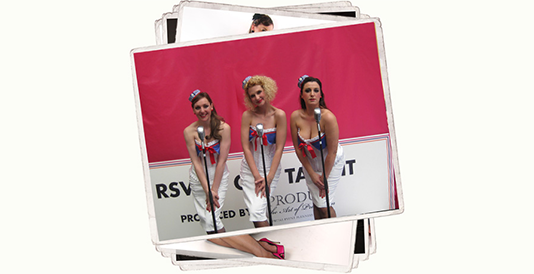 Combining stunning close harmony vocals with bespoke big band arrangements, cute choreography and top to toe pin up couture, The Rockabellas serve up a perfectly nostalgic repertoire featuring toe-tapping tunes from wartime songbirds Anne Shelton, Vera Lynn and The Andrews Sisters, right through to swing sensations Ella Fitzgerald, Nat King Cole and Duke Ellington. For a more quirky take on the bygone years, allow them to perform modern day pop from the likes of Kylie, The Beatles and even Beyonce, all of which they have beaten into submission with their retro sticks! Whether it's a renowned retro joint (The Pigalle, Troxy, Café De Paris), a large corporate affair (Orange, British Airways, Sainsbury's, Nespresso), a public event (the official Queen's Jubilee Family Festival, The FA Cup Final, Epsom Ladies Day, Twinwood), a TV appearance (Ruth Jones Easter Special, BBC2), a military engagement (Sandhurst HQ, Catterick Garisson, National Armed Forces Week) or a private party (Mr & Mrs Jones from no. 5), The Rockabellas have certainly been there, done it and worn the pencil skirt! Or indeed the full military uniform, sailorette costumes, hot pink peep toes, ladybird polkadots, jubilee pin ups or cherry print swing dresses! Yes, you can choose the costume which best suits your theme and scheme! "It Don't Mean A Thing If It Aint Got That Swing!"